The human voice can produce rich and varied acoustic signals to transmit information. Normally, this transmission only has a reach of about 200 metres. The Boras, an indigenous group of about 1,500 members residing in small communities in the Amazonian rainforest of Colombia and Peru, can extend this range by a factor of 100 by emulating Bora phrases in sequences of drumbeats. The Boras do this with manguaré drums pairs of wooden slit drums traditionally carved from single logs (each about two metres) through burning. Each drum can produce two pitches, a pair four in total. 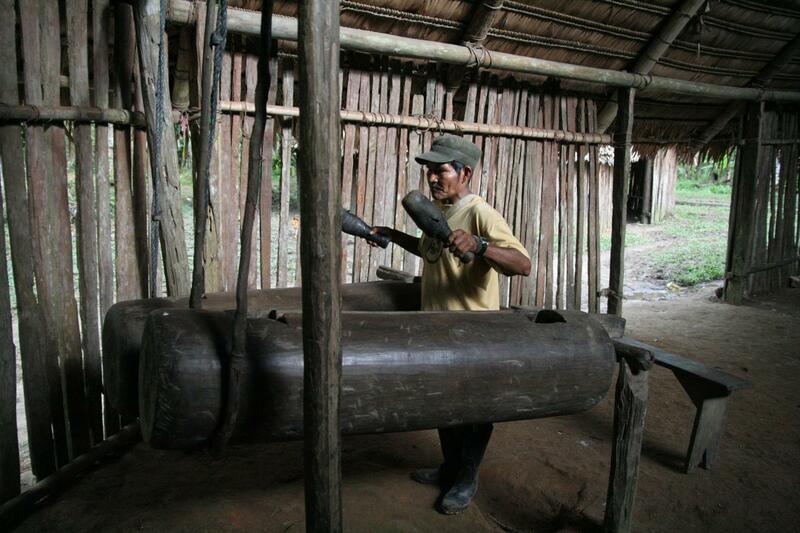 The Boras use manguaré drums in two ways. One is the "musical mode", which is used to perform memorised drum sequences with little or no variation as part of rituals and festivals. The other is the "talking mode", which is used to transmit relatively informal messages and public announcements. "For example, the manguaré is used to ask someone to bring something or to come do something, to announce the outcome of non-alcoholic drinking competitions or the arrival of visitors", says Seifart of the former Department of Linguistics at the Max Planck Institute for Evolutionary Anthropology where the major part of the now published work was done. "In this model, only two pitches are used and each beat corresponds to a syllable of a corresponding phrase of spoken Bora. The announcements contain on average 15 words and 60 drum beats." The Boras use drummed Bora to mimic the tone and rhythm of their spoken language and to elaborate Bora phrases in order to overcome remaining ambiguities. "Rhythm turns out to be crucial for distinguishing words in drummed Bora", says Seifart. "There are four rhythmic units encoded in the length of pauses between beats. These units correspond to vowel-to-vowel intervals with different numbers of consonants and vowel lengths. The two phonological tones represented in drummed speech encode only a few lexical contrasts. Rhythm therefore appears to crucially contribute to the intelligibility of drummed Bora." This, the researchers argue, provides novel evidence for the role of rhythmic structures composed of vowel-to-vowel intervals in the complex puzzle concerning the redundancy and distinctiveness of acoustic features embedded in speech. A team of researchers, including Frank Seifart and Sven Grawunder of the former Department of Linguistics at the MPI-EVA and Julien Meyer from the Université Grenoble Alpes carried out research into the drummed speech of the Northwest Amazon Boras. They found them not only to reproduce the melody of words and sentences in this endangered language, but also their rhythm. This suggests the crucial role of linguistic rhythm in language processing has been underestimated.